Daunketumbar Jawa, Chinese Coriander, and Long Leafed Coriander. It belongs to the Apiaceae, like the species listed above; is a biennial to 30-50cm, propagated by seed, sprinkled on top of the soil. Large oblong leaves form as a rosette. 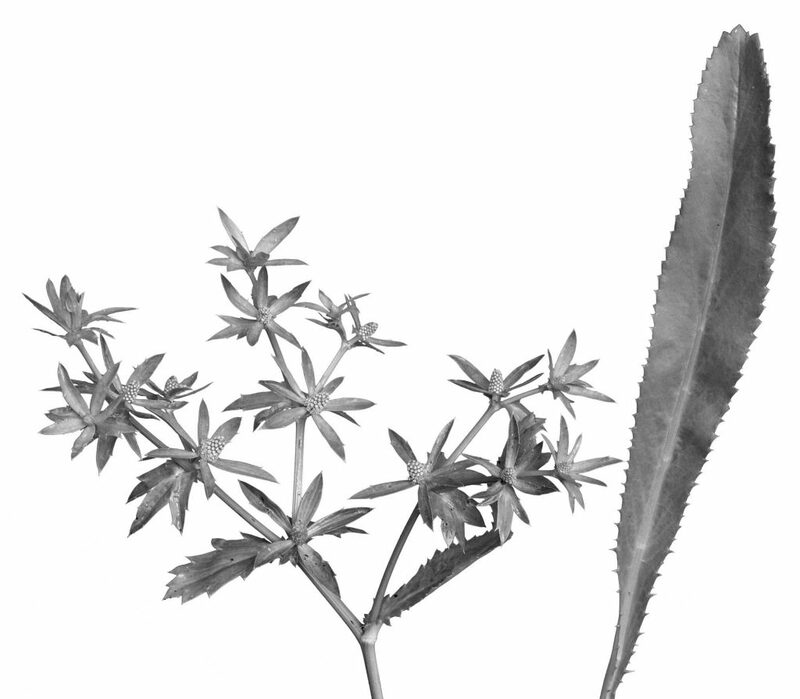 The edge of the leaves are prominently serrated, hence its name, sawtooth coriander. Spiky erect green flower heads form from the centre of the plant, and little raised oval seed heads form in the centre, turning from yellow to brown when mature. If you like the flavour of coriander but have trouble growing the annual species, then sawtooth coriander will give you pleasure to grow and use. The smell and taste is very similar. Sawtooth coriander leaves have good potential for drying as it does retain flavour whereas the annual coriander does not keep its flavour when dried. I always encourage coriander lovers to grow a sawtooth and let it flower, when the seed is brown, cut off the stem, and there will be lots of seeds to get a whole row of plants growing. Thereafter, with the parent plant, always nip out the first signs of a flower appearing so the plant puts its energy into leaf production rather than into flowers and seed. If the plant flowers, the base leaves tend to become yellow and tougher in texture. This species tolerates hot, steamy, humid weather. In summer, watch that plants are given adequate water, if grown in full sun. Plants will also grow well in shade conditions. This species has been used in Indo-Chinese folklore medicine for a variety of ailments, from upper respiratory complaints to gastric upsets. In the kitchen, use the leaves in Thai, Vietnamese and Punjabi dishes. Try the chopped leaves in tossed salads, soups, sauces, vegetables, curries, dips and particularly fish dishes.